This comforter set is gorgeous!i absolutely love it !😍😍😍it is so warm and of quality material!! !i was so happy when it arrived!it is absolutely perfect and completes my bedroom nicely!im looking forward to ordering more thing for my home ! The Belle Bedding Collection provides an elegant look to your home. The top of the comforter is a mix of soft purple, charcoal grey, and light grey with piecing details while the light grey section has an embroidered floral pattern for a soft divide from these bold colors. Made from polyester dupioni, this fabric will produce a shine and pick up the light on both the comforter and shams. The decorative pillows come in a combination of solids, stripes, and embroidery to pull this whole set together. Set includes one comforter, two matching shams, one bedskirt, three decorative pillow. Although the comforter is fine, I had selected it because the color in the picture and in the description was "purple". I knew it wasn't a deep purple or anything, but was disappointed when I received it, because it was more of a mauve, and brown. It really looked more purple-y and gray in the photos. That aside, it seems well-made, came with a bunch of pillows and washed well in a regular washing machine. The fabric is soft and shiny and hangs beautifully. I put the two very small filled pillows on chairs to pull the room together. That still left two large (regular size) pillows (shams) and a square filled pillow for the bed. You can match it with lilac, brownish grey, or beige. I took the pillowcase to the store to match the beige.) The bed skirt is a good size and hangs nicely. I'm very pleased with this set. This set is just gorgeous and is an awesome value!!!! It also seems to be very well made!! Love it!!! I'll be honest, this was not my first choice for comforter, but the first choice had been in backorder so long, I finally said I'm going to find something else, and boy am I glad I did! The comforter is waaaaaay more comfortable than it appears. It's actually very dense and the under part I believe is a type of microfiber that is so nice to curl up to. The pillows fill out the bed and it's basically a big fluff of a bed now. Its look is actually very sleek in person as well. I love this comforter set. It is so soft and beautiful. I was looking for a purple comforter with some gray in it, and it's perfect. The only draw back is the comforter is a little short for my bed and it doesn't meet the skirt. The other difference is, I thought when I turned the comforter over, it would be purple, but it's gray, so it's a little more gray than I thought, but I love it and would definitely recommend the purchase!!! I love this comforter set. Beautiful set, very elegant , I would highly recommend ! 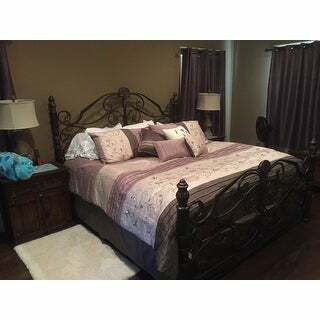 Very pretty comforter set with matching accessories at a great price. The color is a little more on the mauve side rather than a true purple but still very nice. I wanted to love this. It was beautiful in the pictures but when it arrived, the purple was more mauve then lavender and the brown was more black. Definitely not as described. I'm also not happy I have to pay for return shipping when the product description was wrong. The beige in this has green undertones, had to send it back. Pleasantly surprised. Looks really nice and as expected. Think it is very good quality especially for the cost. Great value. Definitely would recommend. Great bed! I ordered this for my daughter and it really is awesome. Great quality and no need for box springs! This looks very expensive but was reasonably priced. "Does this fit an adjustable queen size bed?" Yes, if you choose the queen size. "Is the comforter machine washable? " "Does this 7 piece comforter set come with a bedskirt. It says it does, but one of the reviews said that it didn't." Yes,the bedskirt should be included. "Is it really purple or is it more of a rose color. It looks more pink in the pictures"
I love it, it is a pale lavender, not PINK at all I looked a long time for this color combo, hard to find. It matches my bedroom, I hope. But I have been looking for hallmark Daisy Charm by Triumph bedding so if that ever appears again, please let me know.